Habits are an intrinsic part of who we are and how we function. Habits are fundamental to how we think and behave, which makes them key to how we live our lives and make our decisions. The achievement of our goals and success are more the product of our daily habits than any one off transformative situation or action on our part. if you manage your mind in a helpful way you can utilise the power of habits. Rather than viewing habits in a negative light as something we need to control and overcome, they become an empowering tool to enhance our lives, help us make changes and be happier. To do this we need to know which habits are good for us and to continue and critically which habits are not supporting our goals. The first step therefore is to identify a habit you want to change for a helpful, empowering, positive, healthy or wealthy habit, or a new habit you want to cultivate. This an important step as the funny thing about habits (like limiting thoughts) is we’re not always aware of them. We have to take a deliberate step back to identify the habit or to acknowledge that thing we keep doing but would really love to change is indeed a habit – an habitual way of behaving in response to a situation or action. Now you know the habit you want to change, is it a matter of using your willpower to change it and your motivation to keep going? Yes and no. Yes because when it comes to habits willpower and motivation both have an important role to play but they’re not enough on there own as there are limitations to be aware of. Willpower is the power to exercise your will. To have control over what you do and self-discipline. But the thing about will power is you only have so much of it and when it runs out – because we’re tired or hungry or sad – it’s hard to rely on. This is why you can wake up with good intentions and lots of willpower but by the evening it’s decidedly harder to exercise your will. Although you can get better at exercising willpower the more we do it, your brain likes your habits so wants you to keep them. 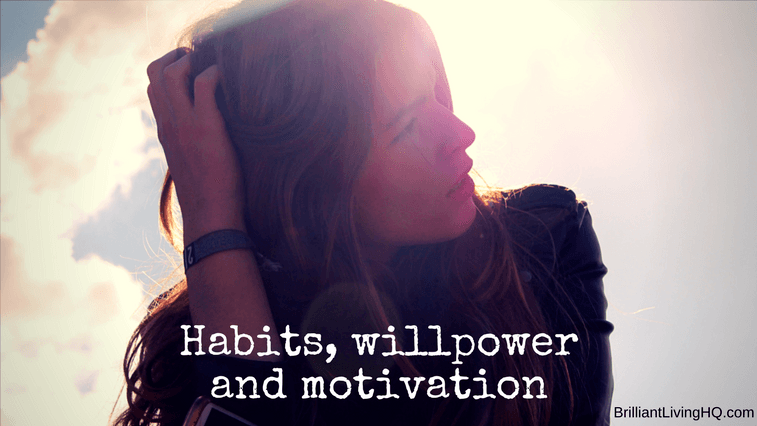 So although willpower has a role to play in changing your habits, it can’t be relied on to do it alone. The same goes for your motivation. Your motivation is the purpose or the ‘why’ behind what you do – in this case behind the new habit you want. I think of motivation as having different levels or layers and each level or layer has a different strength. Think of it as concentric circles –circles within circles like an onion. The outer layer is your big ‘why’ or the purpose that motivates you. Say you want to develop some health and fitness habits– the big outer layer motivation is to be healthier and fitter because it makes you feel better, gives you more energy, to get the most out of life, you look better which makes you feel better, and that makes you a better happier person in yourself and relationships. In short the outer layer is you want to develop healthy habits because being fit and healthy feels good and makes me a happier person. That’s all very well and good but it’s hard to keep that at the forefront of our mind in everything we do – and we know that willpower will only take us so far. Especially as we move in onto the next layer. The next layer or circle in is your situation. For example, you have a busy life, you’re looking after your house, maybe you have a family or a hectic social life or many commitments, and you’re always rushing around from one thing to the next. Then we get to the next layer in which is your career or job that maybe demands a lot from you in terms of energy and time. Next comes the final layer because right in the middle (like the bullseye on a dart board) is a circle which represent you. It has the word ‘you’ of ‘me’ written in it. This is you at this very moment or in the present moment when you’re thinking about it. The point is your motivation which starts off with the best of intentions can get hijacked or watered down as you move through the layers. So first thing in the morning you start off with good intentions about changing your habits but then you get busy getting the breakfast done, getting to work, your energy dips and then the you in the middle circle – i.e. the you at that precise moment – isn’t so worried about the bigger picture because the needs of the moment are nearer to you than the big circle on the outside. And the needs of the moment are that you’re hungry, you’re busy and need something quick to boost your energy but more importantly in that moment to overcome the hunger and to do it quickly and easily in a satisfying way. That’s when you don’t want to just be relying on willpower and motivation and can do with something else to help you. Let’s think about what that could be and to do this we need to go back to the idea of what a habit is. and the reward or what we get out of it – the benefit. This whole habit process or framework is sometimes referred to as the habit loop and it’s a crucial concept to changing your habits. Now comes the clever part. You take this habit loop and use it to your advantage to reduce your reliance on willpower or motivation to help you form new empowering habits to support your goals. In practical terms you do this through disrupting this existing habit loop and tying the new habit you want to cultivate to an existing one. In that way the existing habit or activity becomes the cue or trigger for the new one you want to do. So you take a habit you do every day like cleaning your teeth or having a shower and disrupt or interrupt it – because you’re not necessarily completely changing the habit, you might be adding in a new habit. You’re effectively hijacking or piggybacking an existing habit. I’ve been doing this by interrupting my morning bathroom routine to insert a push-ups and stretching directly in-between cleaning my teeth and having my shower. And it works as I’ve done it every day this year. It’s now intrinsically tied into my morning routine so it doesn’t feel right to get in the shower if I haven’t done my little exercise habit. Try it for yourself. Tie or link your new habit to an existing one and see how long it takes to create a new pattern of normality, in other words a new habit. Let us know how you get on. Hear us talk about all of this and more on episode 99 of the Changeability Podcast. If you like what you’ve read or listened to please help us spread the word by sharing this post and leaving a review on iTunes and subscribing to the show while you’re there. Thank you. That’s an interesting lifehack and an approach I haven’t heard before. I’m definitely going to try to implement it in my own life.